Nephi loved to quote Isaiah. Of the fifty-five chapters in his books, nineteen are from Isaiah, and he quoted parts of other chapters of Isaiah as well. Small wonder, then, that Nephi, rather than always mentioning Isaiah by name, referred to him simply as “the prophet” (see 1 Nephi 19:24; 22:1–2; 2 Nephi 6:12, 14). He explained that he read Isaiah to his people so that he “might more fully persuade them to believe in the Lord their Redeemer” (1 Nephi 19:23). Isaiah 48–54includes some of Isaiah’s greatest work. Six of the seven chapters, slightly changed in some instances, are found in the Book of Mormon; the other chapter, chapter 52, is scattered throughout the sacred record. The Book of Mormon is, therefore, our greatest help in understanding this part of Isaiah’s written work. Use Notes and Commentary below to help you as you read and study Isaiah 48–54. Refer to Enrichment E throughout your study of the book of Isaiah. Enrichment F will provide an overview of the historical setting of the prophet Isaiah’s ministry. Isaiah 48is the first chapter of Isaiah quoted in the Book of Mormon and is found there as 1 Nephi 20. Every verse in the Book of Mormon reads differently from the way it reads in the King James text, and many of the differences are significant. It can be assumed that the Book of Mormon text is more correct than the King James Version because Nephi lived just a little more than one hundred years after Isaiah’s time and most likely possessed a purer text than the one the King James translators worked from. Carefully compare verses 1–2, 6–7, 11, 14, 16–17, and 22 in both versions to see the significant changes. Isaiah 48:1–2describes Israel’s apostasy from God’s revealed ways. While these chosen people of the Lord have “come forth out of the waters of … baptism” (1 Nephi 20:1; compare Isaiah 48:1–2with 1 Nephi 20:1–2), “they do not stay themselves upon the … Lord” (1 Nephi 20:2). In other words, they have apostatized. For this reason, the Lord elected to demonstrate His powers of omniscience. He had, He told them, “declared … things from the beginning,” that is, He spoke of them before their occurrence, and then “shewed them … suddenly” by bringing them to pass (Isaiah 48:3). This He had done, He said, lest the apostates should say, “Mine idol hath done them” (v. 5), or “Behold, I knew them” (v. 7), that is to say, “I already knew that.” The Lord then promised to defer His anger but utterly refused to give His glory to false gods or to suffer His name to be polluted (compare v. 11 with 1 Nephi 20:11). Thus the Lord’s purpose for revealing the future unto man is partly made clear: it is the solid proof that He is truly God, for no mute idol could possibly duplicate such a feat. The entire chapter of Isaiah 49is quoted in 1 Nephi 21. Half of verse one is missing from the King James text. What was lost from the Bible is the statement that the scattering of Israel was a direct result of the wickedness of the religious leaders. Those on the isles who are invited to hearken are the broken-off or scattered branches of the house of Israel. Nephi wrote that by his time “the more part of all the tribes” of Israel had been “scattered to and fro upon the isles of the sea” (1 Nephi 22:4). Moreover it is made clear that the person speaking in these verses, the “me” of Isaiah 49:1–2, was Israel herself. Her mouth was “like a sharp sword” (v. 2) because she possessed the word of God to give to the nations. In many places God’s message is likened to a sword with a keen edge (see Ephesians 6:17; Revelation 1:16; 2:12; D&C 6:2; 33:1). It is double-edged because it cuts regardless of the direction it is moved. “The Lord’s hiding Israel in ‘the shadow of his hand’ is clarified in the Doctrine and Covenants, where the Lord declares that the priesthood holders of this last dispensation are ‘lawful heirs, according to the flesh, and have been hid from the world with Christ in God’ (D&C 86:8–9). This description of priesthood bearers as ‘lawful heirs according to the flesh’ is a reference to the covenant which the Lord made with Abraham that all nations of the earth would be blessed through the literal seed of his body, who would bear the ministry and the priesthood (see Abraham 2:9–11). The Doctrine and Covenants also identifies latter-day Israel as the ‘seed of Abraham’ (D&C 103:17). The world did not know where scattered Israel was, but the Lord knew and had concealed them in his protective hand. (17-6) Isaiah 49:4–12. Did the Lord Forget Israel, His Chosen People? The Restoration was a long time in coming. During the years of waiting, dispossessed Israel undoubtedly felt lonely and forsaken by the Lord. Isaiah 49:4–12shows that loneliness. Verse 4 describes the attitude of one somewhat discouraged, yet not completely so: “I have spent my strength … in vain: yet surely my judgment is with the Lord” (Isaiah 49:4). Nephi spoke of the Jews in their cast-off condition as being “a hiss and a byword and … hated among all nations” (1 Nephi 19:14). Isaiah 49:7describes that condition: men despise and abhor the Lord’s covenant people. But Israel still has hope: “Though Israel be not gathered, yet shall I (Israel) be glorious in the eyes of the Lord” (v. 5). Jacob will yet be raised and restored and stand as “a light to the Gentiles” and as a beacon of “salvation unto the end of the earth” (v. 6). “In an acceptable time” God will hear their cry and “give thee [“my servant,” in 1 Nephi 21:8] for a covenant of the people” (Isaiah 49:8). That began with the call of Joseph Smith. Since then, the call has gone forth to others, “to the [spiritual] prisoners, Go forth; to them that are in [spiritual] darkness, Shew yourselves” (v. 9). They shall be fed with the fruits of the gospel﻿—not “hunger nor thirst”﻿—and shall be gathered into the gospel net “from far … from the north and from the west” (vv. 10, 12). Nephi interpreted the foregoing verses in 1 Nephi 22. His brothers had asked if Isaiah’s words were to be interpreted spiritually or temporally, and Nephi replied that they were to be interpreted both ways (see 1 Nephi 22:1–3). He then described Israel’s scattering and gathering by the Gentiles. First Nephi 22:8–12 gives a very clear interpretation of Isaiah 49. Through the restoration in the latter days, God would show that He remembered the covenant He made with father Abraham. “This Zion of the Lord, in all its beauty, power and glory is engraven upon the hands of Almighty God, and it is before his face continually; his decrees are set and no man can turn them aside. In Isaiah 49:18–21, the latter-day gathering of Israel is spoken of. In the same way that a new bride adorns herself for her wedding day, so will the Zion of the latter days spiritually adorn those who come to her for blessings. This imagery of Christ as the Bridegroom and His covenant people as His bride is seen elsewhere in the scriptures (see Isaiah 54:5; Jeremiah 3:14; Matthew 25:1–13; Revelation 19:7; D&C 33:17; 133:10, 19). And just as a bride puts on her finest clothing in preparation for the marriage, so will Israel clothe herself in righteousness in preparation for her coming “marriage” (see Revelation 19:8, where the “clothing” of the bride is described). So many people will come, both to Zion and the Old Jerusalem, that they will complain that the land is “too strait [narrow] for me: give place to me that I may dwell” (Isaiah 49:20). This overcrowding has occurred wherever the modern gathering has taken place. The Church has a difficult time keeping up with needs for chapels and leadership because of its many converts. Modern Israel has received so many ingatherers that the land is literally “too narrow by reason of the inhabitants” (v. 19). Thus the reaction voiced in verse 21 is quite real: “Who hath begotten me these … ; where had they been?” In other words, where in the world did all these people (Israelites) come from? (17-9) Isaiah 49:22–26. How Will the Gentiles Be Nursing Fathers and Mothers to Israel? Isaiah 49:22–26speaks of the day when God’s promises will be fulfilled and of how it will be done. The “how” is made clear in verses 22 and 23. God will set up His “standard,” the gospel, or the new and everlasting covenant (see D&C 66:2), “and they [the Gentiles] shall bring thy [the house of Israel’s] sons in their arms and thy daughters shall be carried on their shoulders. And kings shall be thy nursing fathers and their queens thy nursing mothers.” (Isaiah 49:22–23.) This prophecy has, as Nephi said, both a temporal and spiritual fulfillment (see 1 Nephi 22:3). But there is another side as well. Following the end of World War I, Great Britain was given the mandate over Palestine and began to facilitate the ingathering of the Jews scattered throughout the earth. Other gentile nations, such as the United States, also rallied to assist. “We see today a miracle being performed before our eyes. Following the war, which we are pleased to call the first world war, the British Premier issued a proclamation to the Jews telling them they could gather and they could have in Palestine a Jewish Home, or state. They began to gather in great numbers. At the beginning of [the 20th] century things in Palestine were in a deplorable condition. They were using wooden plows, water wheel irrigation; they had infested wells and streams. They carried water in skins as of old. Sanitation was deplorable. “The British government changed all of this, when they obtained the mandate. You see, the mandate of Palestine was given to Great Britain. That nation and other nations spent millions of pounds in rehabilitating that land. The Sea of Galilee is now a great reservoir, and the flood waters from the various streams are being diverted into it. In 1947 the United Nations voted to partition Palestine and create a Jewish state in the land for the first time in nearly two thousand years. Thus, the Gentiles participated in the fulfillment of this prophecy, although there may yet be future fulfillment. The “prey” mentioned in Isaiah 49:24is the house of Israel in her scattered condition. She is “prey” or “captive” because she has been unable throughout the centuries to return to her promised home or to claim her gospel blessings. Until recently many gentile countries would not permit Jewish residents to emigrate, and many still do not permit the gospel to be preached freely in their borders. All of that will change, for “even the captives of the mighty shall be taken away, and the prey of the terrible shall be delivered” (v. 25). When Jacob quoted this verse in the Book of Mormon, he added these significant words: “For the Mighty God shall deliver his covenant people” (2 Nephi 6:17), and thus, “all flesh shall know that I the Lord am thy Savior and thy Redeemer, the Mighty One of Jacob” (v. 18). First the Lord predicts it, then He brings it to pass; only a “mighty one” could perform such a task. Nephi made it very clear that all who seek to thwart the Lord in bringing this great thing to pass shall be destroyed, for “they shall fall into the pit which they digged to ensnare the people of the Lord” (1 Nephi 22:14). The Lord employed the figure of a divorce and the sale of a slave to teach that though Israel’s past apostasy scattered them among the nations, the Lord had not set aside the original covenant He made with His people. Chapter 50 continues the theme begun in chapters 48 and 49 that in the last days Israel would be gathered and established again. Under Mosaic law a man who divorced his wife was required to give her a written bill of divorce. She was then free to marry again (see Deuteronomy 24:1–4). Likewise, under the ancient laws, a man could sell himself or his children into slavery to satisfy his creditors. But the Lord had no creditors; neither had He divorced His “wife,” Israel. Instead, Israel had separated herself from the Lord by her sins and was in debt to her evil creditors. “For your iniquities have ye sold yourselves, and for your transgressions is your mother put away” (Isaiah 50:1). But the Lord has power both to redeem Israel from their creditors and to forgive their transgressions against Him. This He assured them He will do. Speaking of the future as if it were already past, He reminded them that He tried to do so once before when He, Jehovah, came to earth as Jesus Christ. This statement is a messianic passage, since Jesus is both Redeemer from sin and Deliverer from evil ways. Yet when He appeared on earth, there was no man ready to receive Him; when He called upon men to repent, there was none to answer (see v. 2). He gave His “back to the smiters” (He was scourged) and hid not His face “from shame and spitting” (v. 6; compare Matthew 26:67; 27:26). But in spite of such rejection and treatment, He still did not divorce Israel or sell her as a slave. The covenant was still in effect, and Israel would be restored to the status of a free and faithful wife of Jehovah. The foregoing imagery may also refer to scattered Israel, for Israel, too, has been smitten and spat upon and scourged through the centuries. Still, Israel is represented as saying that “the Lord will help me; … I know I shall not be ashamed” (Isaiah 50:7). Israel’s confidence and trust in God appears unbounded. “He is near that justifieth me; who will contend with me?” (v. 8). The “he” in this verse is clearly “the Lord” in a parallel verse in 2 Nephi 7:8. “Behold, the Lord God will help me; who is he that shall condemn me?” (Isaiah 50:9). Israel then asks a question, as if they have learned something by their past experiences. “Who is among you … that walketh in darkness, and hath no light?” (v. 10). People trust in themselves; they do not trust in God. Instead, they “walk in the light of [their own] fire, and in the sparks that [they themselves] have kindled” (v. 11). They who refuse God’s revelations and put their trust in their own reason “shall lie down in sorrow” (v. 11). (17-12) Isaiah 51:1–3. What Is Meant By the “Hole … Whence Ye Are Digged”? God’s promises to Israel were stated in a direct way in the Abrahamic covenant. Most Latter-day Saints have patriarchal blessings that declare their descent from Abraham through one of the twelve tribes. Abraham, then, is the “rock” from whence Israel was hewn and the “pit” from whence they were digged. Israel, both ancient and modern, is urged to “look unto Abraham [our] father, and unto Sarah” (Isaiah 51:1–2). They are the ones through whom the Saints claim their promised blessings. By means of the covenant established with Abraham and Sarah, “the Lord shall comfort Zion” and make “her desert like the garden of the Lord” (v. 3). This passage is a plain assurance that God will fulfill for Abraham and his descendants all that He has promised in the covenant. (17-13) Isaiah 51:4. What Law Will Proceed from God? Isaiah 51:4contains a prophecy of the restoration of the gospel law and covenant in the last days. That law and covenant includes modern scripture and living prophets to reveal God’s will anew. (17-14) Isaiah 51:4–16. Who Is Speaking in These Verses? In Isaiah 51:4–16, great emphasis is placed on the pronouns me and my: “my people,” “my nation,” “my judgment,” “my righteousness,” “my salvation,” “mine arm,” “my law” (vv. 4–8). The Lord emphasized these things to stress His relationship with us. He is our Creator, He is our Judge, He is our Savior, and He is our perfect Exemplar. And though the earth itself “shall vanish away like smoke, and … wax old like a garment” (v. 6), the qualities He claims for Himself will endure forever. God is permanent, stable, upright, and dependable. Those who trust in Him need not fear “the reproach of men” (v. 7) but should “awake” and “put on strength … as in the ancient days” (v. 9). This call is from God to His latter-day children to return to Him and “come with singing unto Zion” where “sorrow and mourning shall flee away” (v. 11). As do many other passages in the Old Testament, these verses bear strong witness that Jehovah, the God of the Old Testament, is the same person as Jesus Christ of the New. (17-15) Isaiah 51:17–23. Who Were the “Two Sons” Who Fainted? For centuries the covenant people of the Lord have “drunk at the hand of the Lord the cup of his fury,” or in other words, they reaped the results of their refusal to heed His word and this “wrung them out” (Isaiah 51:17). And the days of judgments for Israel are not finished yet. In the battle of Armageddon, the Jewish nation will once again undergo great oppression and judgment (see Enrichment I). The text of 2 Nephi 8:19–20taken from the brass plates suggests that the two sons may be the two witnesses of Revelation 11:1–6who will keep the armies from defeating the Jews (see also D&C 77:15). The two witnesses are discussed in detail in Reading I-6. As shown in Notes and Commentary on Isaiah 2:3, there will be two headquarters for the Lord and His people during the Millennium: Zion, the New Jerusalem, on the American continent; and Zion, the Old Jerusalem, in the Holy Land. Isaiah 52:1–2is quoted in three places in the Book of Mormon (see 2 Nephi 8:24–25; 3 Nephi 20:36–37; Moroni 10:31) and once in the Doctrine and Covenants. In Doctrine and Covenants 113:7–8, Joseph Smith answered questions about the meaning of Isaiah 52:1–2. He showed that the beautiful garments symbolized the priesthood power restored to the house of Israel in the last days and that the loosing of the bands from her neck signified the removal of the curses of God. If Israel would return to God, new revelations would be given. When the Savior cited passages from Isaiah 52, He omitted verses 4 and 5, perhaps these verses did not apply to the Nephites at that time (see 3 Nephi 20:36–40). Isaiah 52:7is a scripture significant to missionary work. Its interpretation was given in the Book of Mormon where Abinadi was asked its meaning by the priests of King Noah (see Mosiah 12:20–24). The bringer of “good tidings” is Jesus Christ, the “founder of peace.” Those who publish that peace are the servants of the Lord who spread His word. (17-19) Isaiah 52:11–12. Why Does the Lord Counsel That the Departure from Babylon Be Not “with Haste”? (17-20) Isaiah 52:13–15. Who Is the Servant? Isaiah 52:13–15is a dualistic prophecy. On the one hand, it refers to Jesus Christ. These verses belong with Isaiah 53as introductory material for the greatest of the Old Testament messianic chapters. The Savior’s “visage was so marred more than any man” (Isaiah 52:14) when He suffered for the sins of mankind and was crucified on Calvary. Nails﻿—metal spikes﻿—were driven into His hands and feet, and a spear pierced His side to ensure His death (see John 19:17–18, 32–34). On the other hand, the Savior Himself made it clear that Isaiah 52:13also had reference to a servant involved in the “great and marvelous work” of the Father in the latter days (3 Nephi 21:9). The Book of Mormon verse undoubtedly refers to Joseph Smith and the Restoration. Men “marred” him, persecuting him throughout his life until they succeeded in killing him. Yet power was given him by the Father “to bring forth unto the Gentiles” the Book of Mormon as well as other latter-day revelations (see 3 Nephi 21:10–11; see also D&C 3; 10). As a result, kings and rulers of the earth behold and consider things “which had not been told them” (Isaiah 52:15). (17-21) Isaiah 53:1–2. How Did Isaiah Foresee People Receiving Christ? When Isaiah spoke of the Savior as being a “tender plant” without form and comeliness, he meant that Jesus was born as a small, helpless infant just as all people are. Jesus grew as other people do. (17-22) Isaiah 53:3. In What Ways Was Jesus a “Man of Sorrows and Acquainted with Grief”? Jesus experienced tragedy and sorrow throughout His life. Members of His own family did not accept Him as the Messiah at first (see John 7:5). People in His hometown sought to kill Him (see Luke 4:16–30). His countrymen, the Jews, rejected His messianic calling (see John 1:11). One friend betrayed Him; another denied knowing Him (see Luke 22:48, 54–62). In the end, “all the disciples forsook him, and fled” (Matthew 26:56). His enemies demanded His crucifixion (see Matthew 27:22–23). 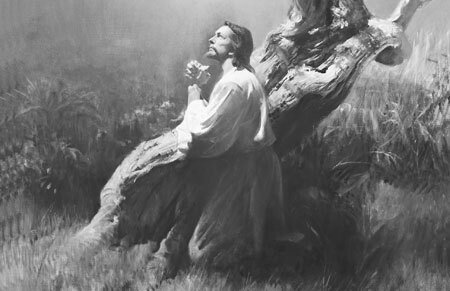 “Christ’s agony in the garden is unfathomable by the finite mind, both as to intensity and cause. The thought that He suffered through fear of death is untenable. Death to Him was preliminary to resurrection and triumphal return to the Father from whom He had come, and to a state of glory even beyond what He had before possessed; and, moreover, it was within His power to lay down His life voluntarily. He struggled and groaned under a burden such as no other being who has lived on earth might even conceive as possible. It was not physical pain, nor mental anguish alone, that caused Him to suffer such torture as to produce an extrusion of blood from every pore; but a spiritual agony of soul such as only God was capable of experiencing. No other man, however great his powers of physical or mental endurance, could have suffered so; for his human organism would have succumbed, and syncope would have produced unconsciousness and welcome oblivion. In that hour of anguish Christ met and overcame all the horrors that Satan, ‘the prince of this world’ could inflict. The frightful struggle incident to the temptations immediately following the Lord’s baptism was surpassed and overshadowed by this supreme contest with the powers of evil. The Savior’s suffering was a vicarious act of one totally innocent assuming responsibility for myriads of guilty ones. Thus, Isaiah said, “He hath borne our griefs, and carried our sorrows” and “was wounded for our transgressions, [and] bruised for our iniquities” (Isaiah 53:4–5). When Jesus stood before Pilate, the governor of Judea, “he was accused by the chief priests and elders” of many evil things, but “he answered nothing” in return (Matthew 27:12). “Then said Pilate unto him, Hearest thou not how many things they witness against thee?” But Jesus held His peace and “answered him … never a word; insomuch that the governor marvelled greatly.” (Matthew 27:13–14.) In fulfillment of Isaiah’s prophecy, “as a sheep before her shearers is dumb,” so Jesus “openeth not his mouth” (Isaiah 53:7). While it was yet early in the morning, the soldiers in charge of Jesus brought Him “from Caiaphas [the high priest] unto the hall of judgment” of Pilate’s residence (John 18:28). Later, at the time of crucifixion, Jesus’ cross was placed between two evil men who were thieves (see John 19:18; Luke 23:32–33). After Jesus’ death on the cross, Joseph of Arimathea, a rich man, went to Pilate and begged for permission to bury Jesus. Joseph laid the body “in his own new tomb, which he had hewn out in the rock” (Matthew 27:60). An examination of Matthew’s account shows that the remarkable detail with which Isaiah foretold the Savior’s arrest, trial, death, and burial was accurate. (17-24) Isaiah 53:10. Did It “Please” Father in Heaven to “Bruise” His Son? Obviously God was not pleased with the way Jesus was treated, but He was pleased with His Son’s “offering for sin” (Isaiah 53:10). The Atonement met the strictest demands of God’s innate justice and made forgiveness and mercy possible on certain terms. (17-25) Isaiah 53:10. In What Way Does Christ, through His Righteous Offering, “See His Seed”? Who Are the Seed of Christ? Abinadi explained who the seed of Christ will be (see Mosiah 15:10–13). (17-26) Isaiah 53:11. How Did Christ’s Sacrifice “Satisfy” the Father and Thus “Justify Many”? “Then Jesus Christ came upon the scene as the Mediator between man and God, and the Advocate for man with the Father. He pleads our cause. As our Mediator, through his ministry, he labors to reconcile us, to bring us into agreement with God his Father. “An advocate is one who defends or pleads for or in behalf of another. A mediator is one who reconciles or brings about agreement between parties. (17-27) Isaiah 53:12. How Will Jesus Receive a “Portion with the Great” and “Divide the Spoil with the Strong”? “A joint-heir is one who inherits equally with all other heirs including the Chief Heir who is the Son. Each joint-heir has an equal and an undivided portion of the whole of everything. If one knows all things, so do all others. If one has all power, so do all those who inherit jointly with him. If the universe belongs to one, so it does equally to the total of all upon whom the joint inheritances are bestowed. Once again the figure of a marriage is employed. Israel is called a barren wife because of her inability or unwillingness to produce spiritual offspring for the Lord. But in the end, when she is gathered once again, there will be more children from the “desolate,” or temporarily forsaken, wife than when she enjoyed her wedded status in ancient times (Isaiah 54:1). This being true, space must be found so that the latter-day “tent” of Zion can be expanded to accommodate them all. When one wishes to make a small tent larger, one must pull up the stakes and move to a further distance from the center pole. This is what is meant by lengthening the cords and strengthening the stakes (v. 2; see also Notes and Commentary on Isaiah 33:20–24). Israel’s latter-day growth through conversion and gathering is represented as breaking “forth on the right hand and on the left” (Isaiah 54:3). In ancient times, the inability to bear children was considered a great curse by women of the Middle East. As a gathered “wife,” Israel will forget the shame or cast-off status of her earlier years and rejoice in her new and prosperous condition. She is once again “married” to the Lord (see vv. 4–5). The barren or forsaken years, though they seemed long, were but a small moment compared to the vast eternity that lies ahead (see vv. 6–8). (17-29) Isaiah 54:9–17. What Is Meant by the “Waters of Noah”? When God makes promises, He keeps them. He vowed to send a flood to cleanse the earth in Noah’s day and then covenanted with Noah that He would never again destroy the earth in that manner (see Genesis 9:13–17). His promise to restore Israel in the latter days is “as the waters of Noah unto me” (Isaiah 54:9), that is, His promise to restore Israel is just as sure as His promise to Noah. Mountains may depart and “hills be removed” (v. 10), but God’s promise will still see fulfillment. In her gathered condition Zion shall be beautiful. The precious gems mentioned in verses 11 and 12 represent the material and spiritual blessings that redeemed Israel will enjoy (see also Revelation 21:19–21), including children being “taught of the Lord” (Isaiah 54:13) and knowing great peace. Those who gather together to oppress latter-day Israel “shall fall for thy sake” (v. 15), for “no weapon that is formed against thee shall prosper” (v. 17; see also Doctrine and Covenants 71:9–10, where a similar promise is made to Joseph Smith and Sidney Rigdon). As you read these chapters of Isaiah, did you notice how Latter-day Saints are the only ones who can fully understand what Isaiah foresaw? The scholars of the world made a significant contribution to your understanding of the history and language of Isaiah. But only modern prophets can provide the key to understanding what the prophet saw when he wrote of future realms. More than any other people, the Latter-day Saints can understand why the Savior said, “Great are the words of Isaiah” (3 Nephi 23:1). When Jesus came the first time, He came to His own people, but they knew Him not (see John 1:11). Isaiah had been called to his ministry to testify of Christ so that Christ’s own people would not be justified in rejecting Him. Read Isaiah 53, and then read the accounts in the four Gospels of the last week of the Savior’s life (see Matthew 26–28; Mark 14–16; Luke 22–24; John 18–21). Reread Isaiah 53, slowly and thoughtfully. Ponder each phrase carefully. Identify aspects of the Lord’s mortal life that Isaiah prophesied of. How do the prophecies in Isaiah 53help you to understand and appreciate the Savior?